Located in the south of France, this territory is made up of 58 municipalities that compose 4 intercommunalities. It is set up in order to carry out a common sustainable development project, involving the active participation of citizens, associations, companies, as well as the involvement of public partners. So, together, they can define the modalities and thematic lines of work required to provide social and economic growth for this area and its inhabitants, while taking into account the preservation and the enhancement of its natural and cultural resources. Stemming from the strong proximity of marine and mountain area, this territory presents highly contrasting landscapes. It is made up of massifs, each with its own typical environment : the Vallespir, the Aspres, the Albères, and the Vermeille Coast. The source of the river Tech is located in the Haut-Vallespir, in the Costabone massif. It flows along a narrow valley and then gradually meanders across an alluvial plain with plantations of trees and fields of vegetables, before ending its journey when it reaches the Mediterranean sea. At the end, it irrigates a coast made up of wide, sandy beaches and sheltered coves dominated by steep cliffs. It is here that the chain of Pyrenees plunges into the sea. On the steep slopes of this range, terraced vineyards form a unique, orderly landscape, the result of the meticulous work carried out by winegrowers. At the other end of the territory, the Canigó Massif is 2,784 meters at its highest point and raises proudly the signs of Catalan identity. This common culture on both sides of the border encouraged cross-border cooperation, translated into projects, some of which are financed by European funds. 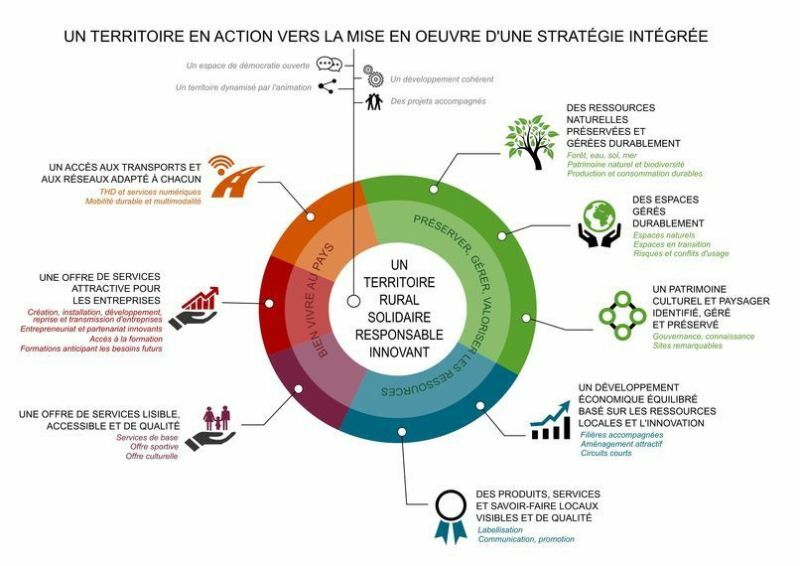 The Pays Pyrénées Méditerranée is firstly a tool for local development, a process that uses local initiatives as an engine of economic, social and environmental development. It is based on the definition and the implementation of a strategy shared locally on the territory composed of 4 intercommunalities. This tool to the benefit of all, makes it possible to coordinate and federate initiatives, and give more coherence and impact to public fundings. Missions : Territorial animation / Emergence and project management / Financial engineering / Support for project managers / European program management / Production of knowledge and tools for decision-making (studies, strategies) / Monitoring and evaluation. The Pays Pyrénées Méditerranée is nationally recognized because of its selection to be CBE (Employment Area Committee), and also TEPCV (Positive energy Territory for green growth). The Territorial Climate Plan (PCEAT), is a good tool to achieve the objectives defined by the Agenda 21. Indeed, as it is a real support of reflection for the local actors, it will enable to define which problems will have to be overcome and what way will be implemented to achieve them. On the basis of the results given by the energy diagnosis, it was possible to define what figured objectives should be taken, and how to achieve them. The Pays Pyrénées Méditerranée used this document to define a territorial “Agenda 21”. The cycling strategy is one of the axis of development of the TCP.